Boycott Cyber Monday with this Gmail search trick. My Slate colleague Will Oremus told you why you should boycott the marketing mess that is Cyber Monday. I’m here to help you do so in Gmail by allowing you to delete all of those promos rapidly. In the steps below, I use Gmail’s advanced search operators to limit my query to only those items currently in my Inbox, which includes all of your tabs, including Promos. If, like Farhad Manjoo, you think it’s useless to chase inbox zero, then this will help even more. 1. 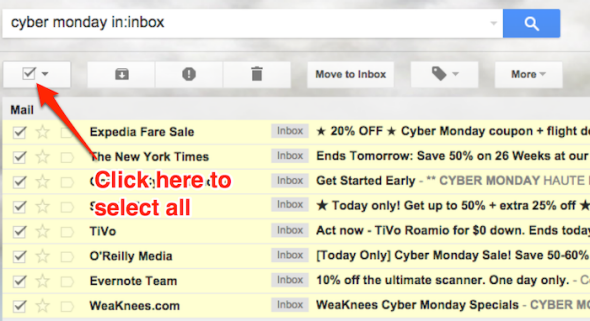 Type “cyber monday in:inbox” into Gmail’s search box. 2. Click the “select all” box to check all the messages. 3. Click the trash can icon to delete. Done. Of course, you may have to do this again later in the day, but the satisfaction will make the already minimal effort worthwhile. If you’re feeling really aggressive, save this as a Gmail filter and have Gmail delete them before you ever see them.